The differences in allocation got me thinking about a separate issue. What about the extent of overall diversification in North Dakota compared to the United States as a whole? Do we see more diversification in one area compared to another? I have two graphs to offer up on this point. 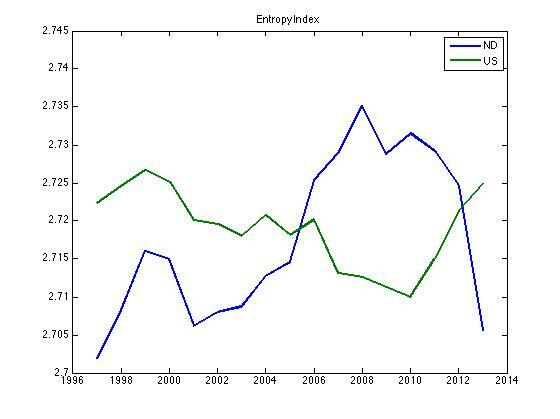 The first is an Ogive index and the second is an entropy index. 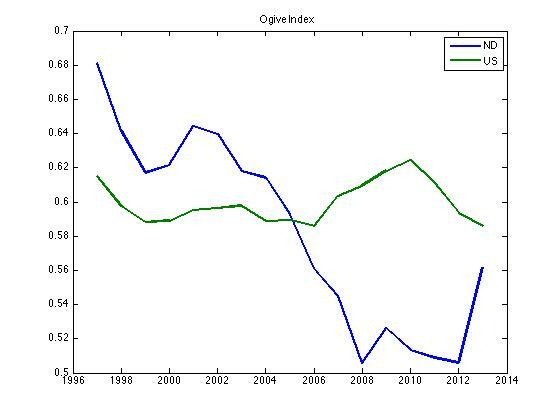 In an Ogive index lower numbers indicate better diversification. Now it is true that North Dakota is lower, but close attention to the y-axis shows that the difference is not that great. Also, it is worth noting that North Dakota is getting less diversified of late, due mostly to increasing concentration of activity in oil. For the entropy measure higher numbers indicate more diversification. Again, while it looks like there is a conclusion to be drawn from this, the y-axis scale tells us the difference is actually quite small. The conclusion that can be drawn from this is that while North Dakota and the United States have different allocations of economic activity, the two areas have a similar degree of diversification. The success of North Dakota compared to the United States or other states is due mostly to the returns being higher in the industries where North Dakota has a higher concentration than the United States. I’ll delve further into the numbers and offer up a few other measures in some later posts.